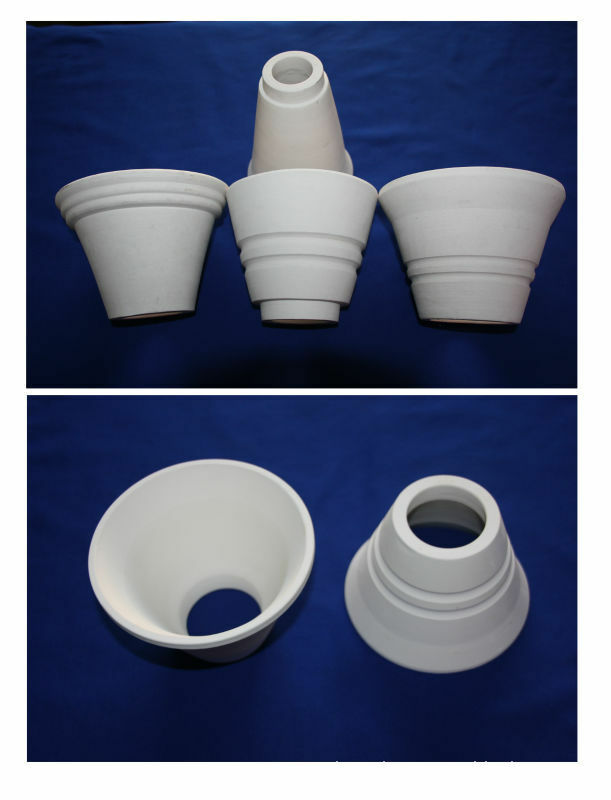 Ceramic pouring cup are an essential component of manufacturing quality investment castings. The pouring cup is typically mounted to the wax down sprue and becomes part of ceramic shell. This offers the advantage of mold stability and a strong target area for metal impact, as well as creating a lowered potential for inclusions due to shell breakage. At present, our products are used in the investment casting of aerospace and automatic. This product is produced from high alumina silicate material, through high-temperature sintering. The performance is more excellent than similar products. 1. smooth surface finish, Erosion resistance. 2. High strength, Structural stability during the pour. 3. High thermal shock resistance. 4. No reaction with metal liquid in high temperature due to chemical stability. 5. Ceramic cup can be produced to customer size.